The latest version is based on LIBSVM version 3.17 & CUDA SDK 5.5. Executables: Windows 32-bit, Windows 64-bit, Linux 64-bit. Source code: Windows Visual Studio 2010 project, Linux makefile. This version is based on LIBSVM version 3.0 & CUDA SDK 3.0. Windows 32-bit version, Windows 64-bit version, source code (VS2008 project). Windows 32-bit version, Windows 64-bit version. Updated to LIBSVM version 3.17. Updated to CUDA SDK v5.5. Using CUBLAS_V2 which is compatible with the CUDA SDK v4.0 and up. Updated source code is now provided. 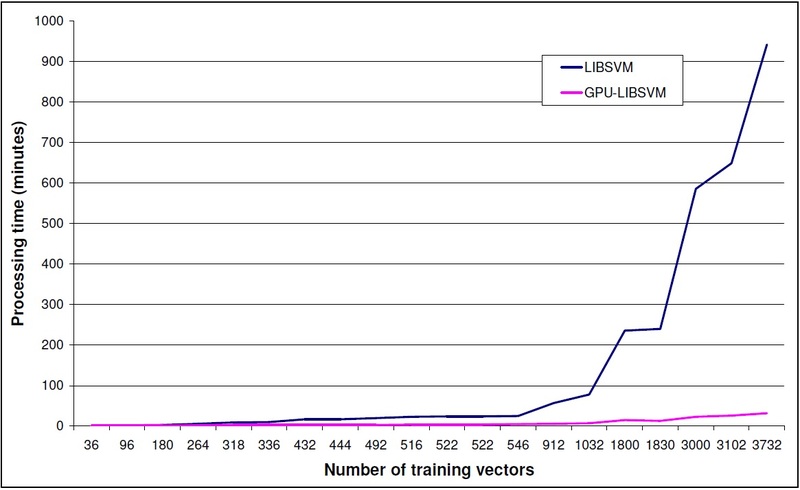 First release of the GPU-Accelerated LIBSVM in Windows 32/64 bit. The project has been built in both 32/64 bit mode. If you are working on 32 bits, you might need the x64 compiler for Visual Studio 2010 to build the project. Please update the VS2010 redistributables to the PC you are running your executable and install all the latest patches for Visual Studio. Problems also seem to arise when the input dataset contains values with extreme differences (e.g. 107) if no scaling is performed. Such an example is the "breast-cancer" dataset provided in the official LIBSVM page.